Chess Life gets a new look! Dan Lucas continues he vision to reinforce the position America’s chief chess magazine as a world-class publication. 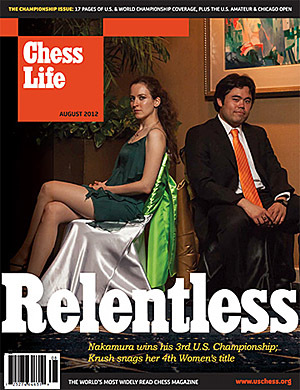 Chess Life will now be in full-color which seems to be the trend for many publications. Years ago, the Wall Street Journal and New York Times added color to their layout. 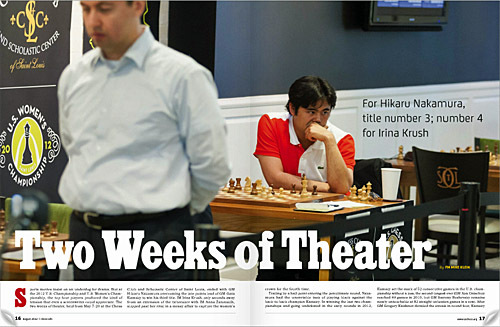 New in Chess, arguably the world’s best chess magazine, introduced full color in 2011 departing from the old standard. Chess Life joins the color movement with an improved look and enriched content. One would think that with magazines becoming extinct that this is counter-intuitive, but the idea is people will pay a premium for the few quality magazines that are left because they become increasingly rare. It’s a good strategy and one likely to reap some benefits. 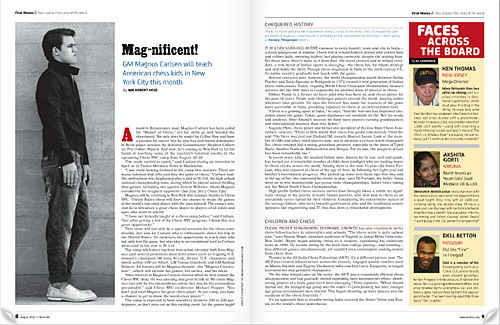 Here is a peek inside the August 2012 issue. 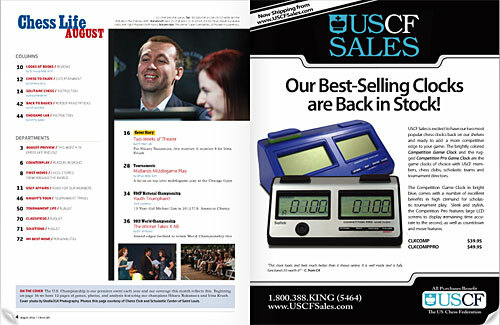 Effective with the August 2012 issue of Chess Life, available now for USCF Members via our online viewer or pdf download at uschess.org, the USCF’s flagship magazine is in full color after six years as a two-color publication. The magazine will be arriving in our Premium Members’ mailboxes soon. A few items have been added to take advantage of our new look: “Faces Across the Board” (p. 9) by Al Lawrence will celebrate class-level players who have a chess accomplishment of note or interest. “Knight’s Tour” (p. 46) is a tournament travel section that will highlight one or more of the events in each issues’ Tournament Life section. “My Best Move” (p. 72) will look at a chess, business, or celebrity personality each month and ask them to describe either their literal or figurative best move. We hope you enjoy Chess Life’s refreshed design and the same great chess coverage you’ve come to expect. If you would like to be featured in “Faces across the Board”, please email facesacrosstheboard@uschess.org. If you are an organizer who would like to have their event featured in “Knight’s Tour”, write to letters@uschess.org. If you wish to suggest someone for “My Best Move”, also use letters@uschess.org.